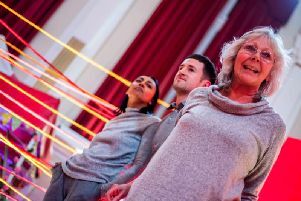 A successful stage group which tours the North West is coming back to its hometown of Chorley to celebrate its anniversary. ComedySportz UK started 14 years ago as ComedySportz Chorley, beginning life at Chorley Little Theatre before moving to Chorley Football Club. Brainne Edge, ComedySportz UK founder and manager, said: “It started as a group of 10 kids playing games for whoever wanted to watch. “As the ComedySportz family grew, the show moved to Manchester and we now enjoy regular shows across the North West. The show still has five of its original Chorley members who have all remained active members of Chorley Little Theatre, and has featured local talent throughout its life including Stephanie Threlfall, who is set to play Aladdin in this year’s CADOS pantomime. “We started with the ethos that comedy should be for everyone and our all ages show will entertain kids, parents and grandparents alike,” Brainne added. The show pits two teams battling it out for laughs as players create quick-witted sketches, scenes and songs from whatever suggestions are thrown up by the audience. It’s a family friendly show that’s fast, feel good and always unpredictably funny. There’s a referee on hand to steer the entertainment, call any fouls and help the audience decide the winner. Rachel Wareing, who has been a member of ComedySportz UK since its inception, added: “It’s comedy as a sport, not comedy about sports, and the fans can be just as passionate. The gang comes to Chorley Little Theatre on Saturday, November 21 at 7.30pm. Tickets are £6 from Malcolm’s Musicland in Chapel Street, or from www.chorleytheatre.com. To find more about shows and workshops, visit www.comedysportz.co.uk.